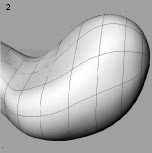 Within Rhino, contour curves are created through the form. This is done by selecting surfaces, polysurfaces, and meshes for contour line creation. The distances between the contours must be specified and the contour curves are created where the contour planes intersect the surface and poly surfaces. The lofted contour curves have a surface mesh as shown which must be deleted before exporting into the Finite Element Analysis software. This eliminates the problem of working with thousands of nodes and elements in the FEA package. The deleted leaves polylines which can then be exported as a *.dxf file to the FEA package. At this stage the scale of the original maquette was changed so that the project better mimicked the design of a habitable space/building. The distances between the vertical contours was specified such that the overall length of the free form was approximately 40 meters. Model with vertical and horizontal contours. A contoured model with and without a surface.